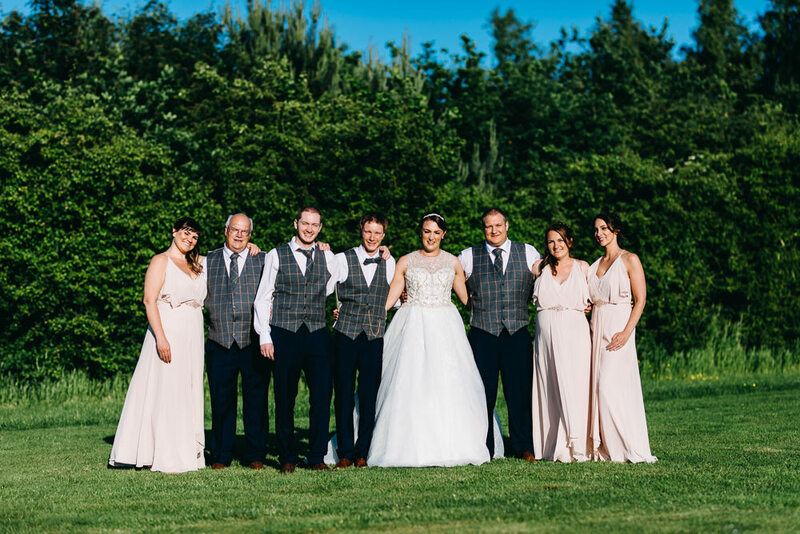 All the joy today with WWW readers Sarah and Jon who were hitched on the 2nd June 2018 at Bawdon Lodge Farm in Leicestershire. Hooray! 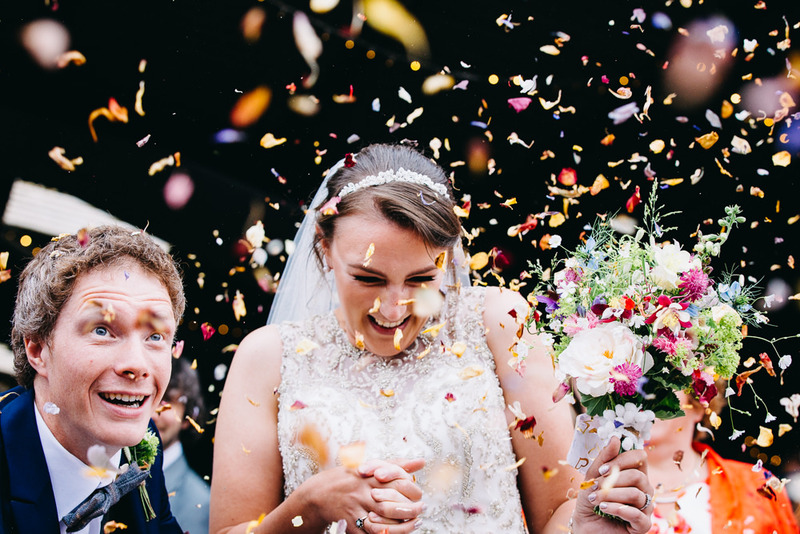 You can just feel the love and happiness radiating from the header image above by Hannah Hall Photography can’t you? 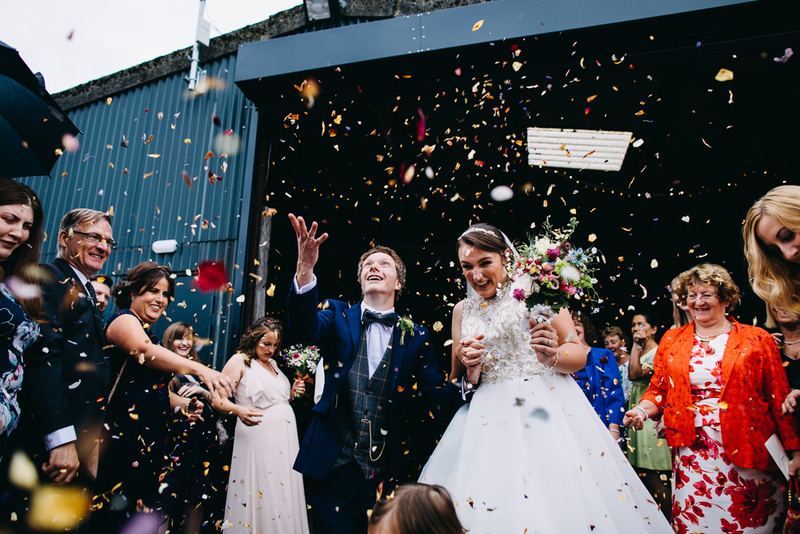 In fact all of these glorious images, which we are so thankful to be sharing with you, are filled with the loveliest of emotions and a lot of colour to boot. 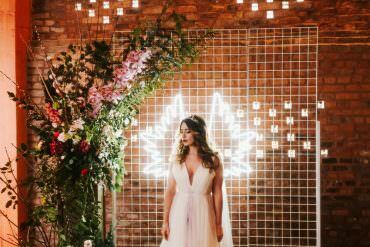 Their vision was simple, to create an outdoorsy affair, filled with bright colours and a reflection of their personalities. It all turned out beautifully and it looks as though lots of fun was had by all. 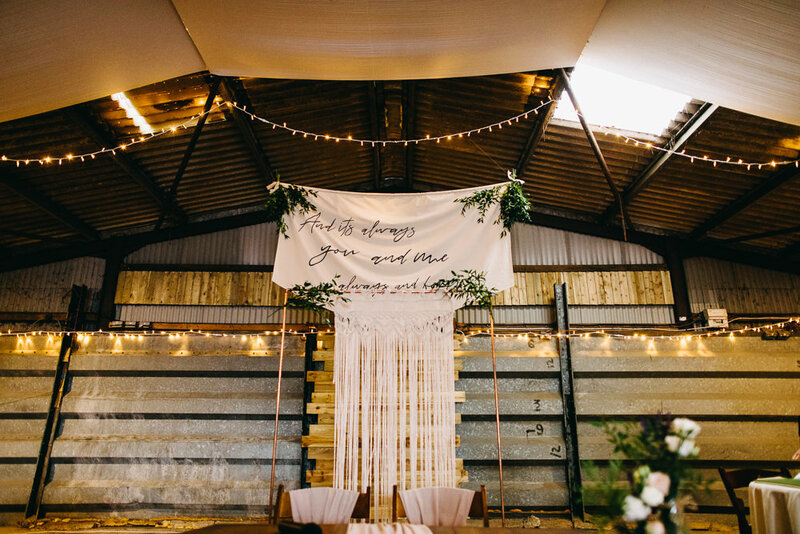 Sarah and Jon were married in the barn, which was decorated in beautiful bohemian style. 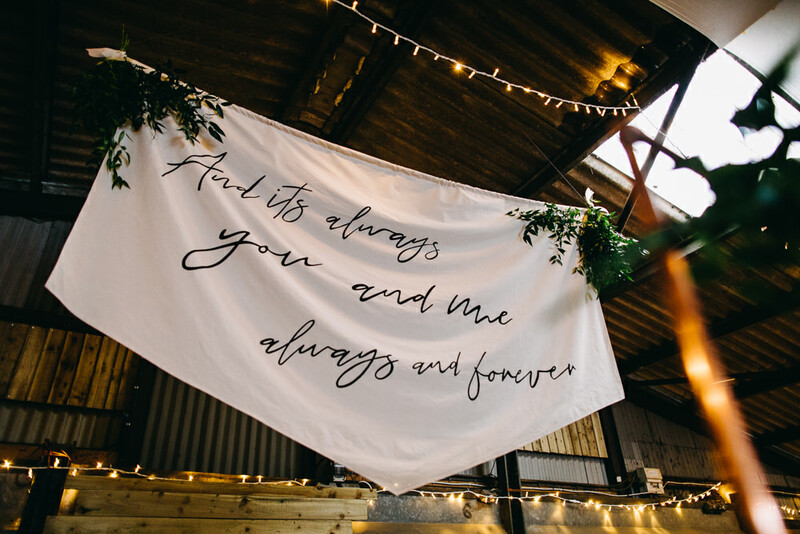 Think macramé backdrop, greenery, fairy lights and a statement love quote banner. What a way to say I do, in complete and utter style! 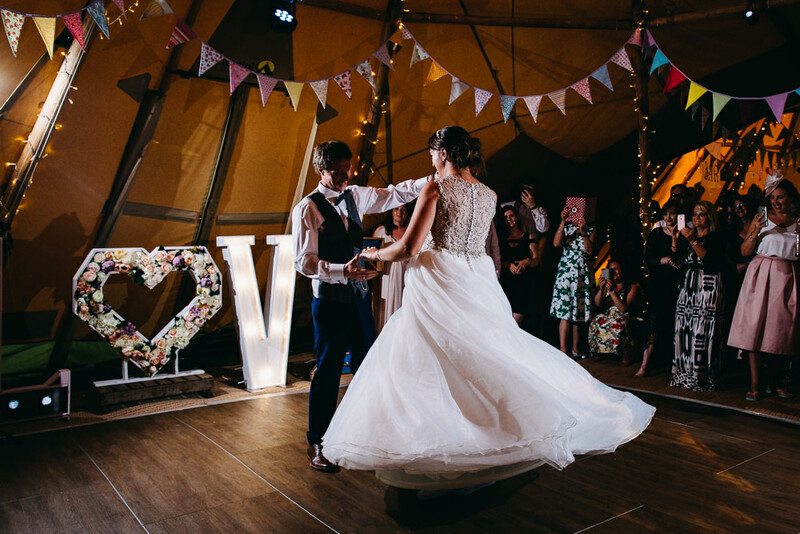 They then celebrated with their guests in a magical tipi decked out with personal, thoughtful touches, before live music entertained and guests camped over in bell tents. What a celebration! 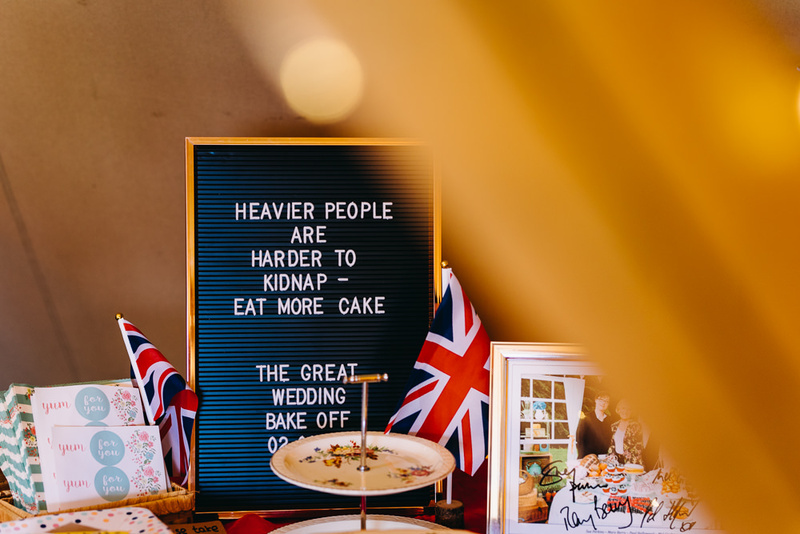 Keep your eyes peeled for pretty florals, gorgeous attire and even a cake bake off. Brilliant. If I’m honest I never thought Jon would propose and I mean NEVER. So when he said I could go anywhere in the world for my 30th birthday and I chose Rome the thought of a proposal didn’t even cross my mind. All of my friends kept saying to me ‘he’s going to propose’ but I just continued to shrug it of with a ‘nah, it wouldn’t be Jon’s style’. Well didn’t I turn out to be wrong…. It was the 11th September 2016 when the unexpected happened. We’d been out exploring the city for the day and just as we were making our way back to the apartment the sky turned black, the wind howled and the heavens opened. I have honestly never seen rain like it. We paddled through ankle deep water (no exaggeration) to get back to our apartment block and stood in the doorway like two drowned rats. When I look back now I can see the look of pure horror on Jon’s face as I emerged later that evening holding what I thought was an empty rucksack. As I’m patting the inside of the bag to see if it had dried at all, little did I know there was a little black box in the bottom which had somehow stayed dry in the storm. Jon admitted later on that night that he was dying inside at this point, he really thought he’d been busted but fortunately I hadn’t even noticed! A little later on when we were just about to go out for dinner I turned to find Jon on the floor down on one knee and the rest is history! Jon said that he had originally intended on proposing at one of the landmarks around Rome but with possibility of becoming the latest Japanese tourist attraction and fear of being run over by locals on mopeds he had quickly decided to stick to the safety of the apartment instead! We decided pretty early on that we weren’t keen on anything too formal or traditional. 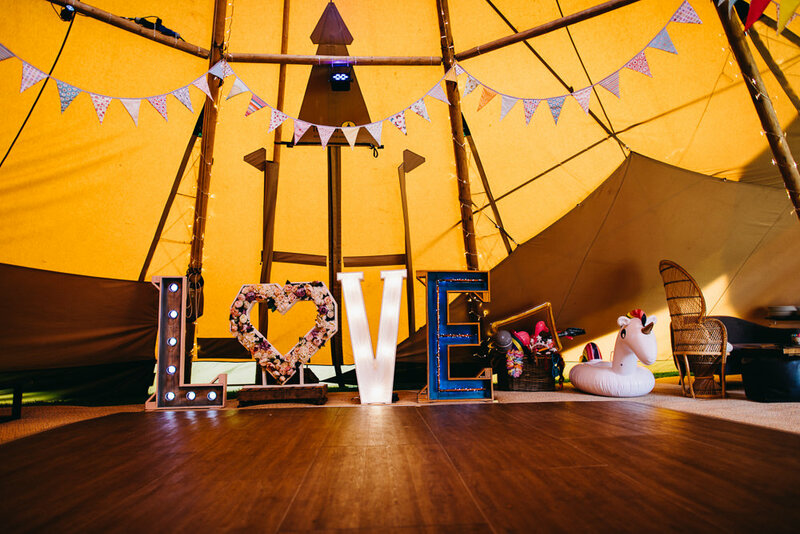 Quite simply we wanted something outdoorsy with a mash up of bright colours and all the things and people we loved in one place. 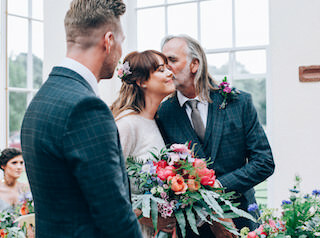 The aim was to create a reflection of our personalities; a wedding day that people would look back on and think ‘that was so them’ and looking back on it now I think we achieved our goal! 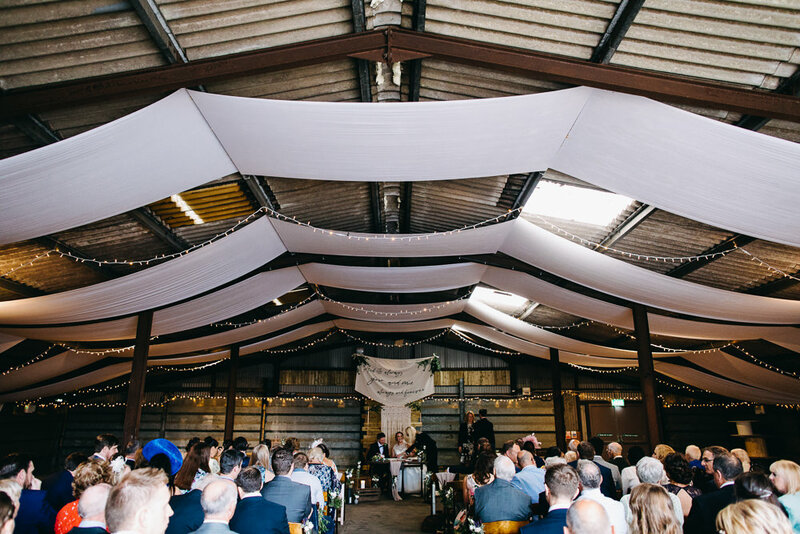 We had originally decided to take our time a little with the planning process but after finding the perfect venue and falling in love we knew we had to set a date quickly for 2018 before they became fully booked. I set up a budget spreadsheet and spent the next 18 months carrying a dedicated planning notebook with me everywhere. 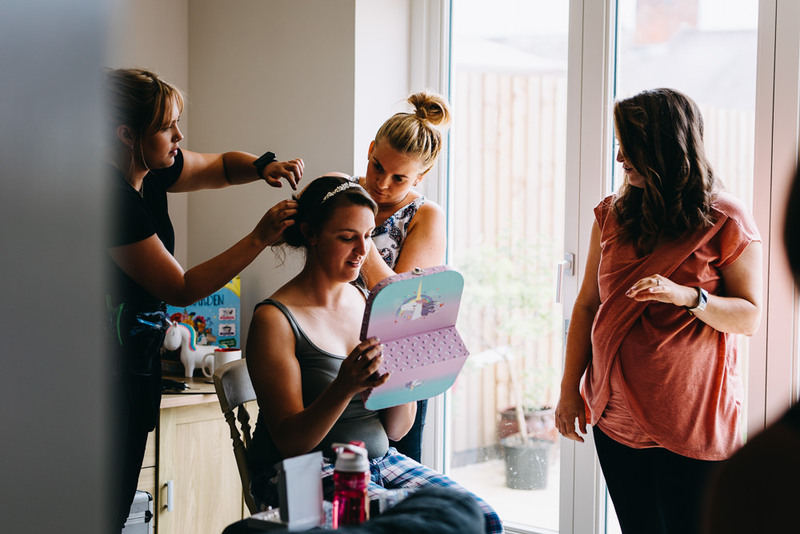 I would recommend this to any bride so whenever you have any ideas or inspiration you can jot them down before you forget as it very quickly can become overwhelming. Most of the ideas came from spending hours online. 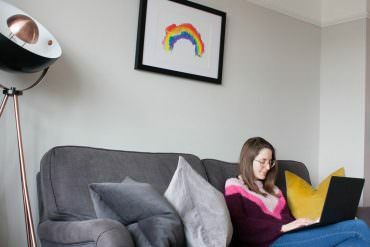 I have always been a massive Pinterest addict so I very quickly created board after board crammed with ideas (I may of already had a few in secret but don’t tell Jon!). 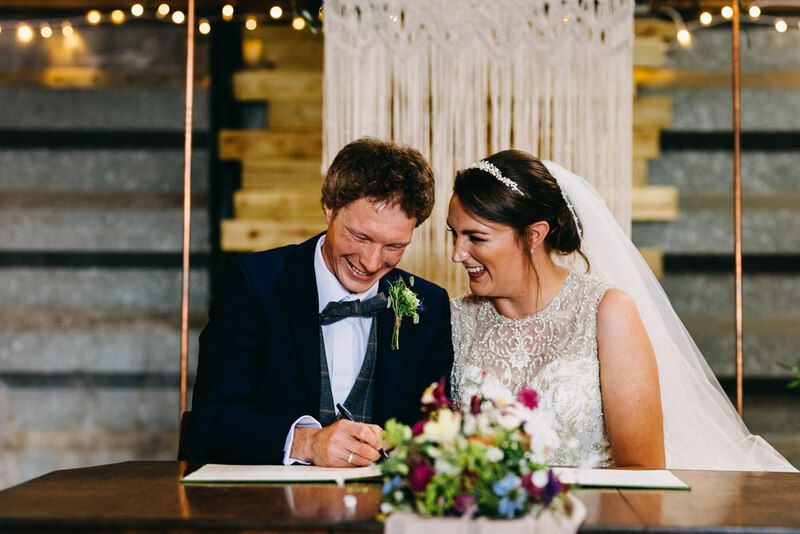 I also took a huge amount of inspiration from WWW – real bride blogs are a fantastic planning aid! 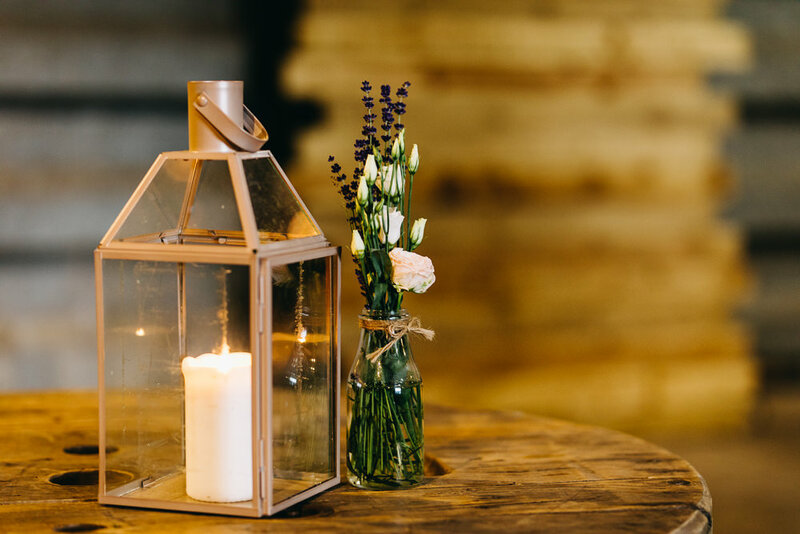 Our original budget was £15k but we totally and utterly blew it…. We found it was so very easy to slip into the mindset of ‘well we’re only doing this once so what’s another hundred pound’ and suddenly it escalates. 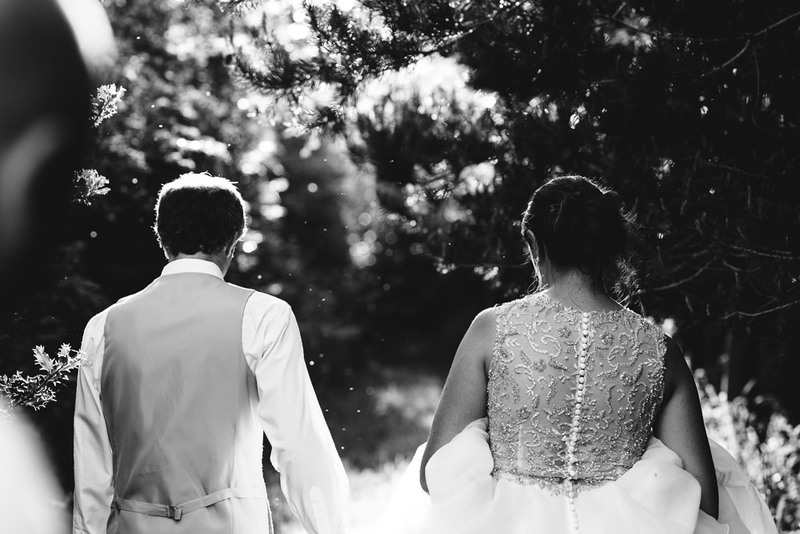 Don’t get me wrong, we had the most perfect wedding and it was worth every last penny! 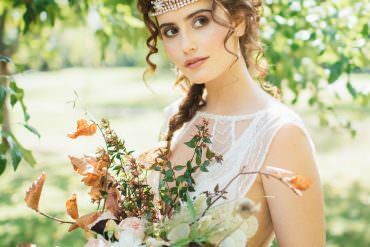 It’s true what most brides say – the dress you think you want is normally the exact opposite of what you end up with! From day one I declared I didn’t want a princess, I didn’t want a lot of bling and I definitely didn’t want a train. 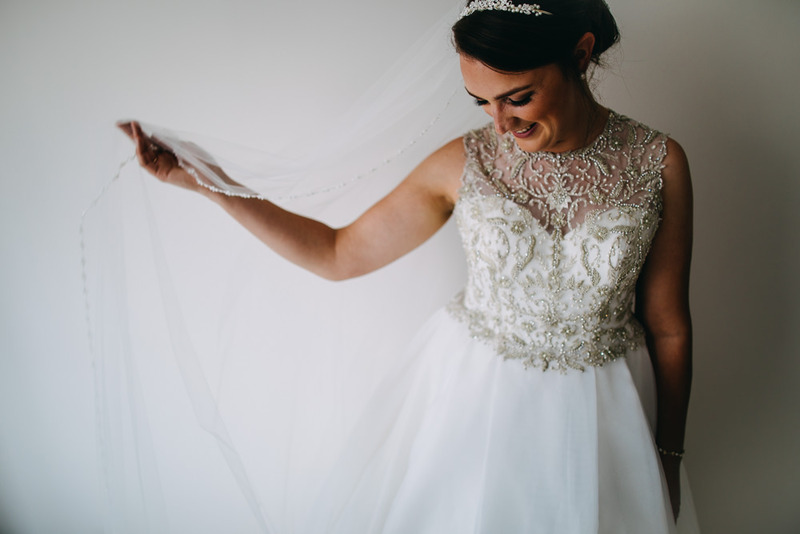 And when it came to it the dress I tried on first because I thought it wasn’t what I wanted was the one I fell head over heels in love with! I have to confess I wasn’t looking forward to dress shopping in the slightest. 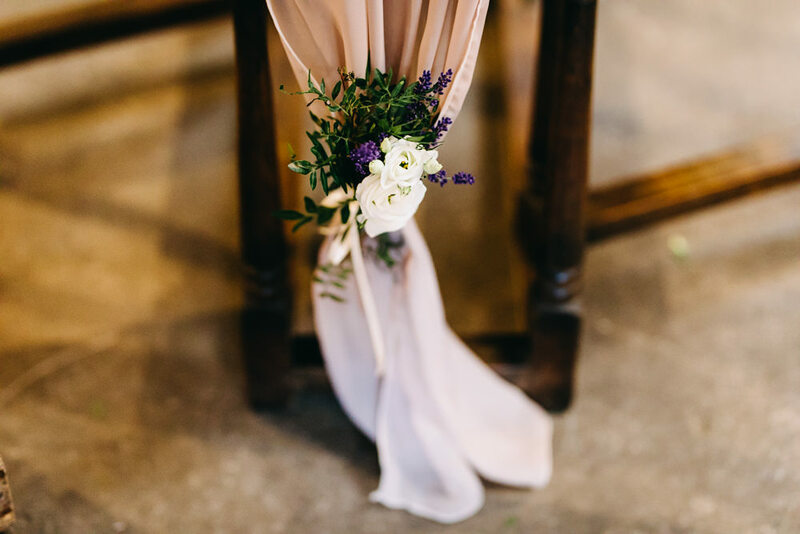 I reluctantly agreed to go with my Mum to an end of line/sample sale ran by Soar Valley Brides but as soon as I arrived I was so glad she talked me into it. The ladies running the sale were so lovely and really made me feel comfortable and there were rails and rails of dresses so I had the opportunity to try many different styles on. 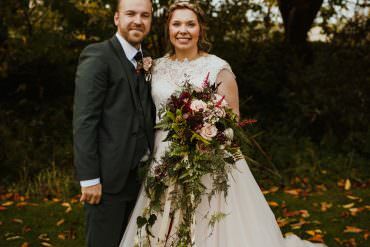 The dress I chose was an Alfred Angelo from the Sapphire collection and it was the perfect fit so I knew it was meant to be. 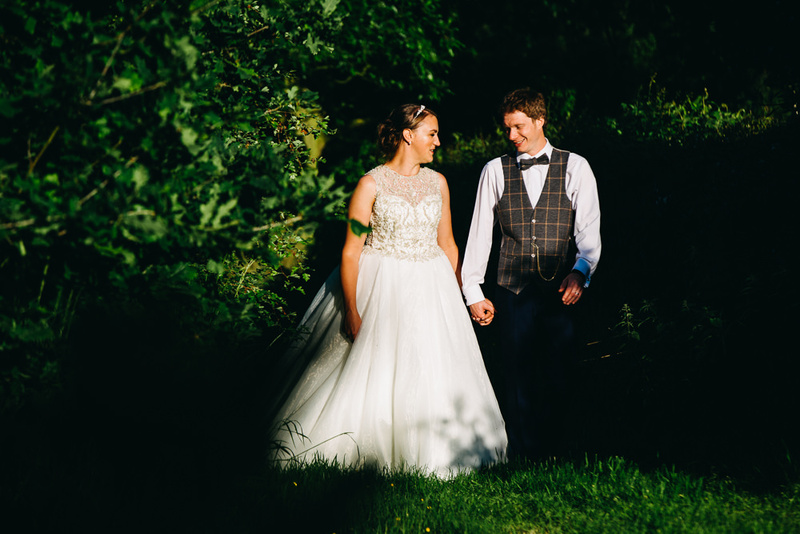 My tiara and veil were also both from Soar Valley Brides and finished of the outfit perfectly. I always knew I wanted flat shoes so my daytime shoes were ballet pumps from ASOS which reflected my obsession for unicorns and I also had a pair of lilac converse for dancing the night away. Jon decided to go for blue suits as he knew this would be the best colour to suit everyone. He wore a blue 3 piece suit with a grey tweed waistcoat, bow tie and brown shoes. 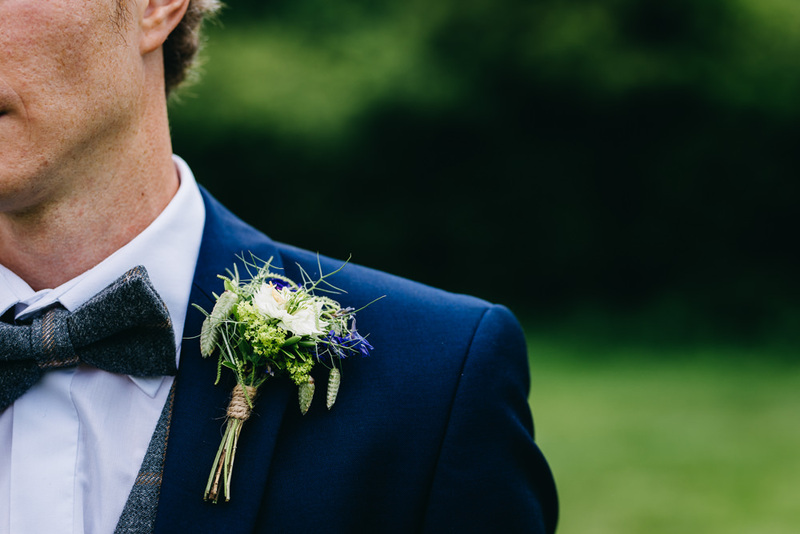 Jon’s only other accessory was a pocket watch which belonged to his Grandad. 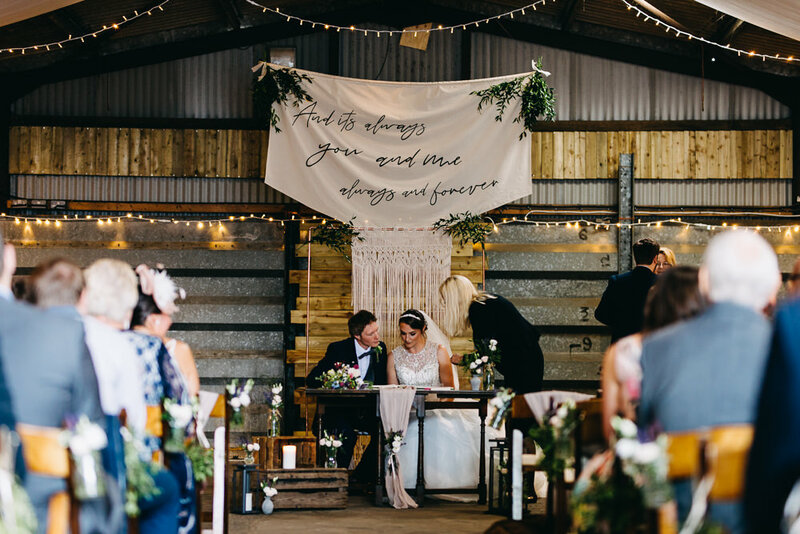 We’re both big lovers of all things countryside so it was really important to us to incorporate the outdoors into our wedding. We looked at a number of more traditional venues but nothing seemed to feel very us. 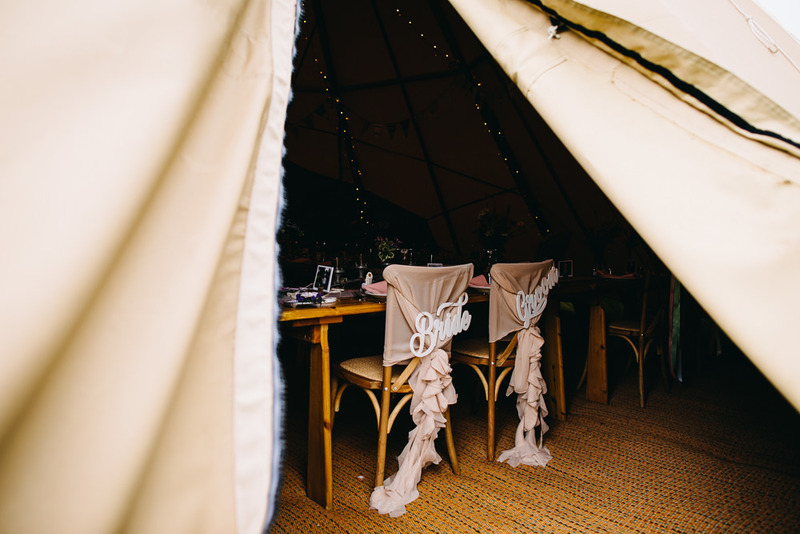 My Pinterest at this point very quickly became focused on beautiful tipis that had totally stolen my heart so when the opportunity arose to have a tour of a local site where we could pitch them I signed us straight up! 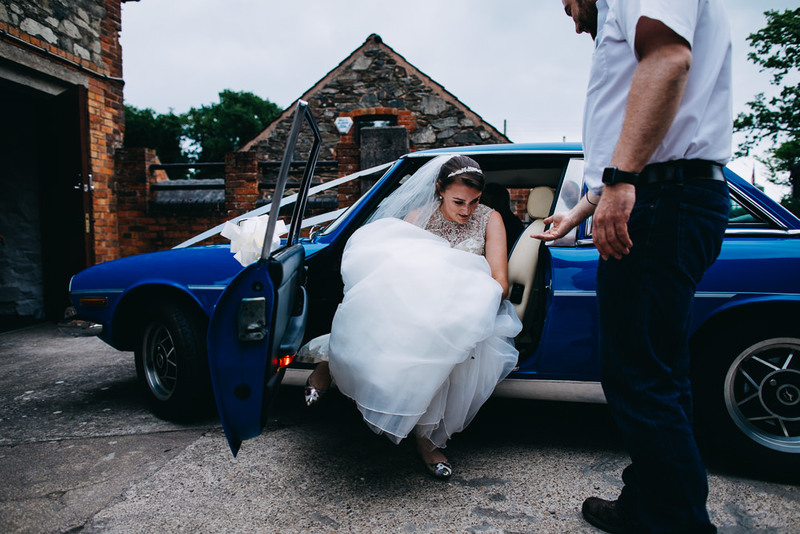 Being on our doorstep, I had often driven past Bawdon Lodge Farm and thought what a beautiful spot for a wedding but the moment we stepped out of the car I fell in love with every inch of the place. 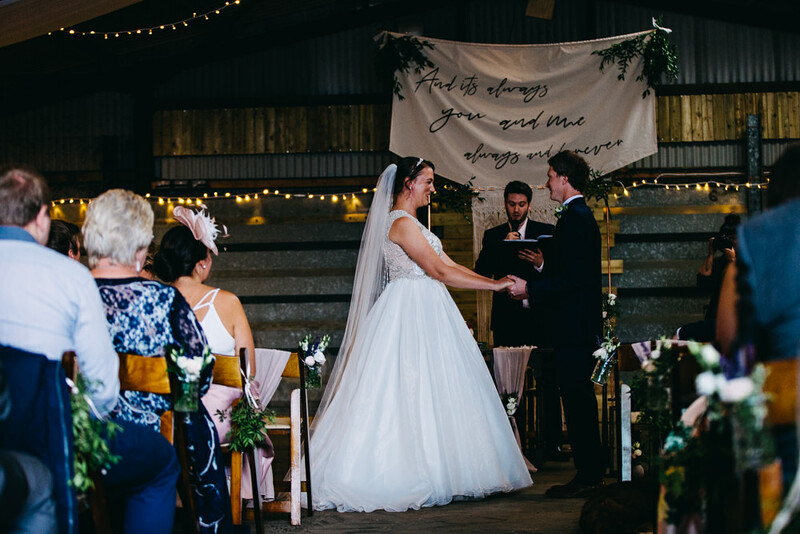 We were really keen on being able to do everything in one location so when they mentioned they were looking into licensing their barn for ceremonies we knew we had finally found the perfect venue. 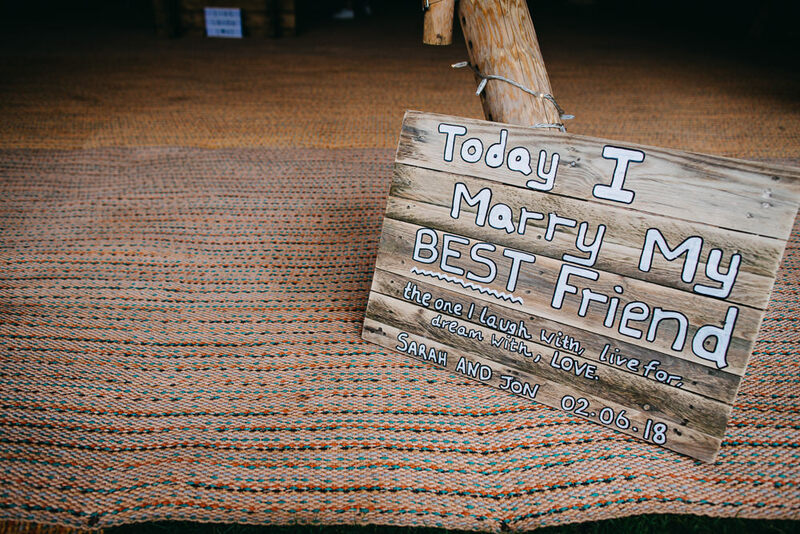 From that very first meeting Lynn and Richard from Bawdon and Jodie from Sami Tipi were wonderful to deal with, nothing was ever too much trouble and they genuinely cared as much about our wedding as we did. 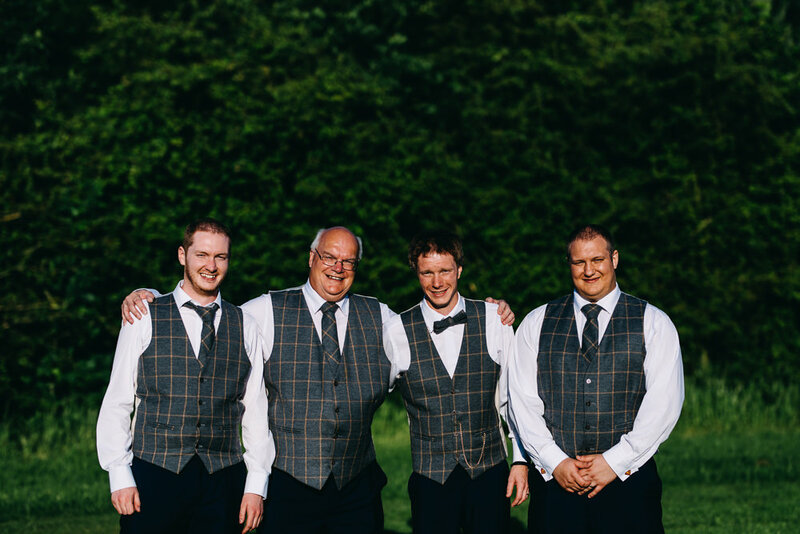 They as people were a massive deciding factor in choosing them as suppliers and from day one we couldn’t of imagined working with anyone else. On the day the team at Bawdon were superb and coordinated everything and everyone for us. 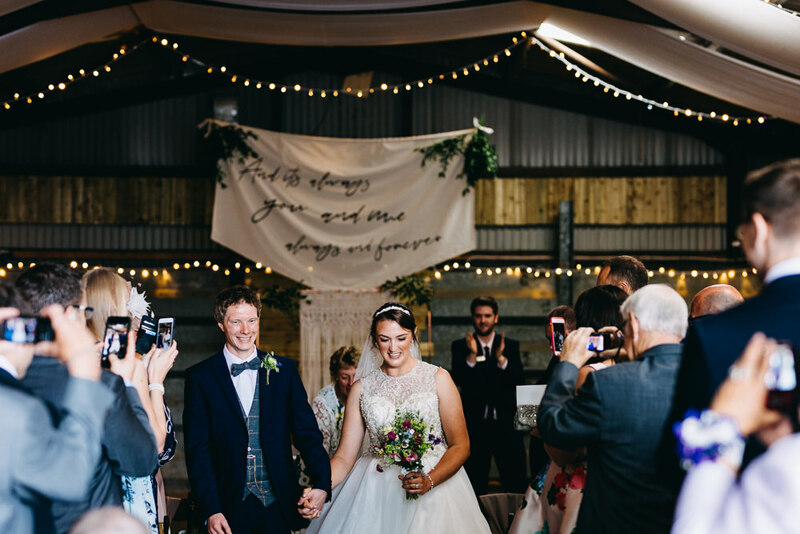 We were also lucky enough to be the very first licensed ceremony to take place at Bawdon Lodge Farm and we couldn’t have been prouder to take those first steps down the aisle! 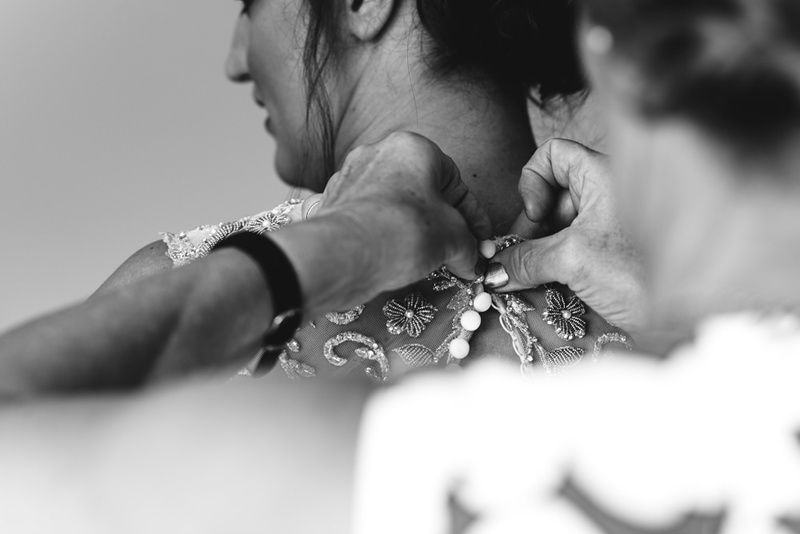 I always knew with the style of my dress that I wanted all of my hair up so that all of the beading would be on show. I had my usual hairdresser, Sheardesire, as I won’t let anyone else touch it! My make up was done by Ruby J Beauty who had done a friend’s wedding last year so I knew I liked her style. 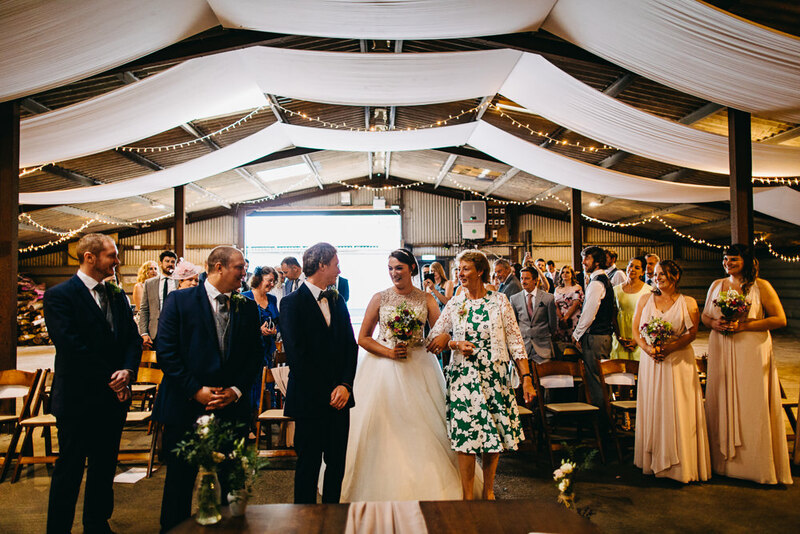 We had chosen two readings for the ceremony; an extract from An Awesome Book of Love by Dallas Clayton and That Still and Settled Place by Edward Monkton. 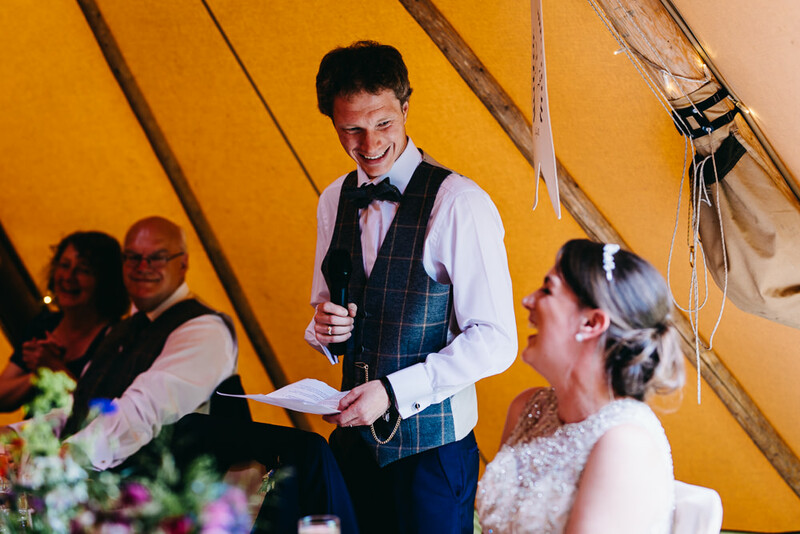 On the day my very good friend Derick, that should of read the latter, was running a teeny weeny bit late so missed his slot and was invited by the best men to do his reading during the speeches as a forfeit. 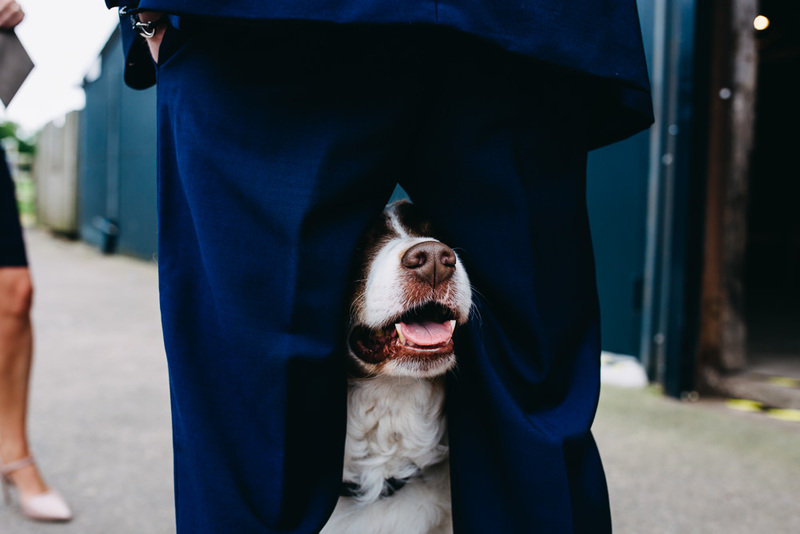 I have to say it did provide us with a lot of laughs throughout the day and fortunately he was a good sport about the whole thing! For the ceremony and drinks reception we had Mango Acoustic Duo. They performed a song for entrance and exit and two songs during the singing of the register which we had chosen prior. 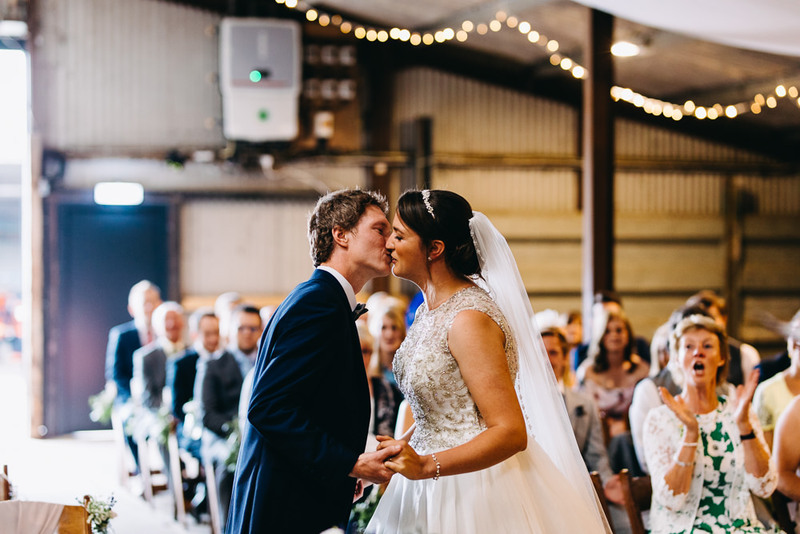 It was really special to have live music for the ceremony they added a lovely relaxed and intimate feeling to it. They then moved outside and set up with their jukebox so guests could request song choices. In the evening we opted for a DJ and live music by Monroe. We had really wanted a live band for the evening from day one but couldn’t find one we liked until six weeks before the wedding when we saw Monroe performing at a charity event. 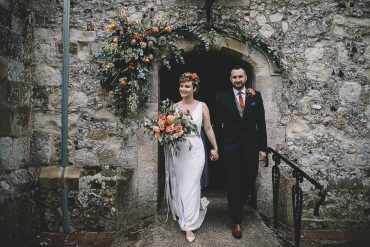 We were absolutely blown away by how good they were and fortunately they were free for our date so we snapped them up quick! We met the lovely Maria from The Flower Patch at a Sami Tipi open day and I knew she was exactly what we were looking for. 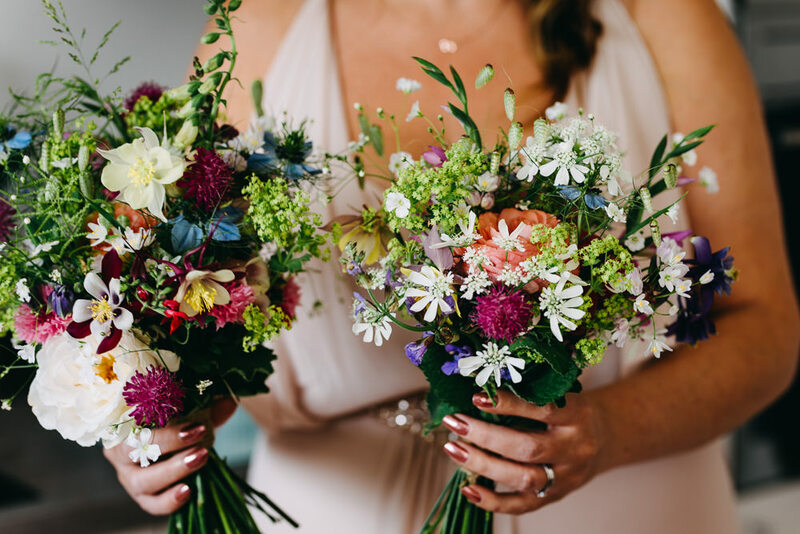 She was so passionate about her work and I loved the fact that all the flowers were all seasonal, grown in her garden locally and handpicked with love. We opted for her buckets and bouquets package so on the day we had mixed stems to decorate the tables ourselves. 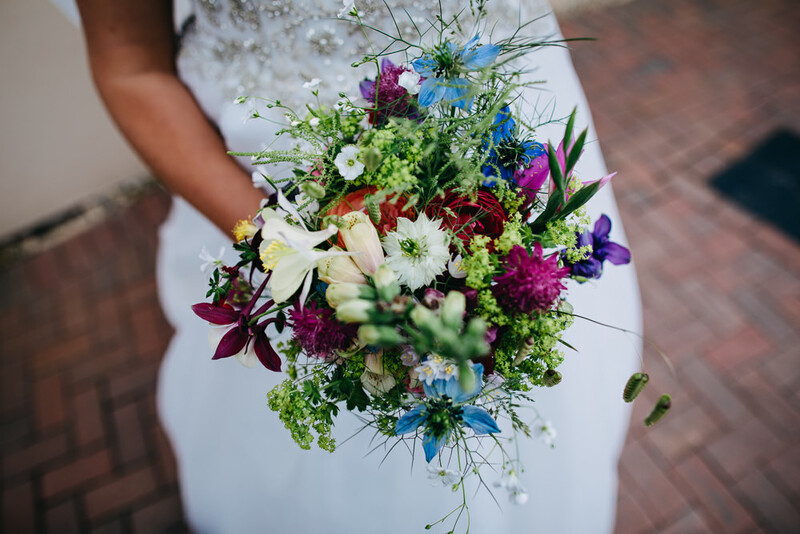 I specified the colour as brights and left the rest to Maria’s magic and my goodness were the bouquets and buttonholes stunning! Instead of having a traditional cutting of the cake we opted to run our very own Great Wedding Bake Off! 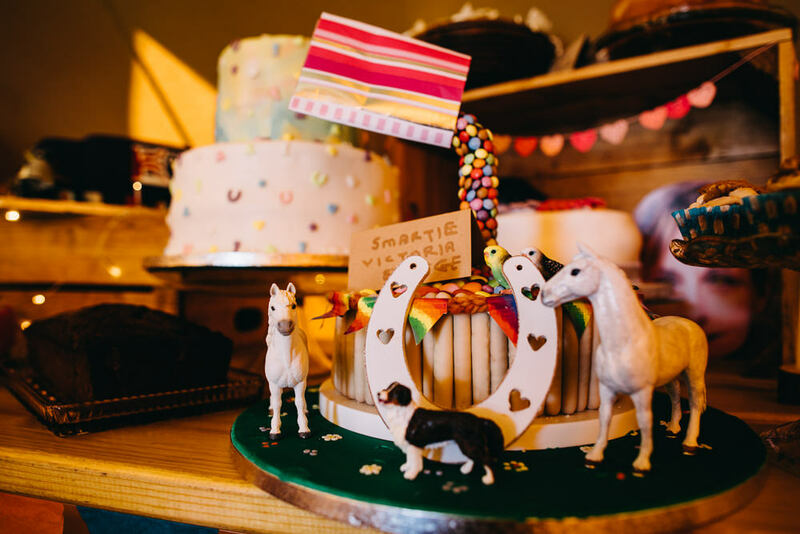 We invited all of our day guests to bring their favourite cake, bake or dessert to be judged with the chance of being crowned the champion. We had a whooping 26 entries in total were totally overwhelmed with the sheer amount of effort, turns out we have very competing friends! Rather than judge the entries ourselves we delegated to a judging panel of cake experts consisting of Thomas the Caterer, Richard from Bawdon Lodge and Jon’s two brothers, Rob and Ed. We handpainted a cake stand at our local paint a pot studio for the champion and I handmade fimo lay star baker magnets for everyone who took part. 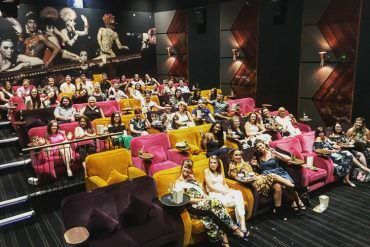 It was a lot of fun and a great way to get all the guests involved. I am a natural hoarder so I spent months gathering everything I could possibly think of or that looked remotely useful. 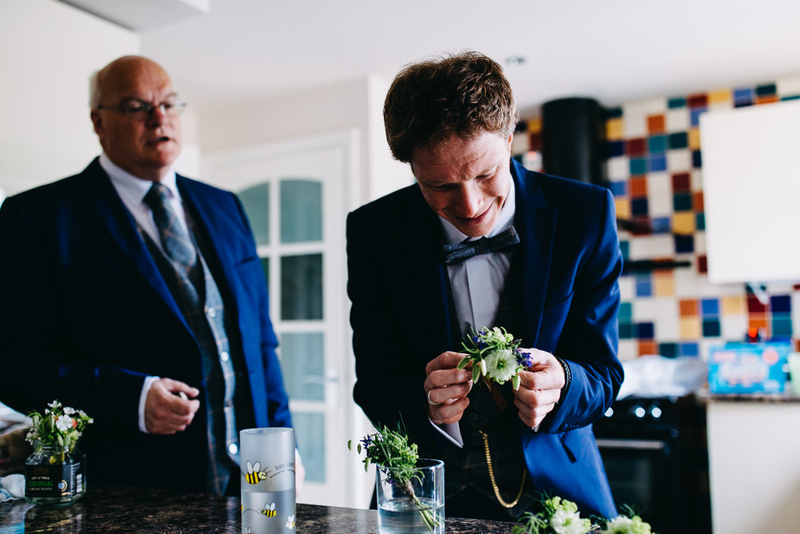 This slightly backfired when we moved house six months before the wedding and Jon suddenly realised the amount of wedding related things I had accumulated…I had even taken over his man shed! 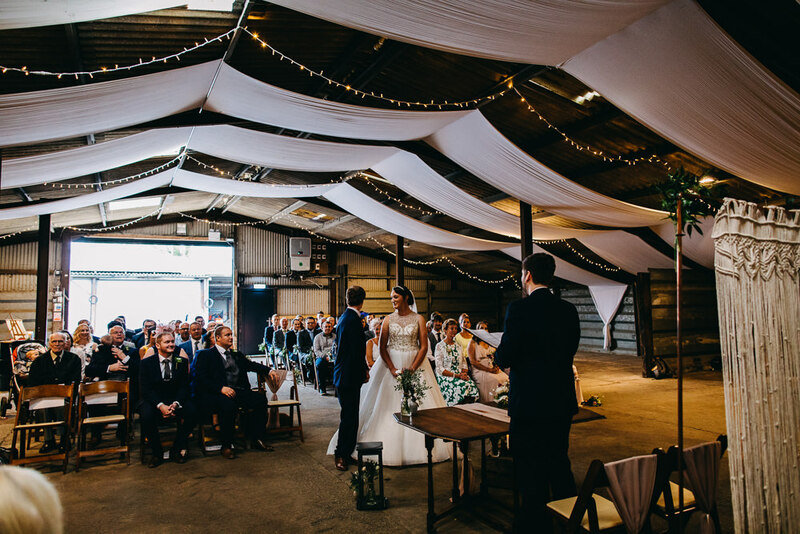 We were very lucky that Bawdon Lodge had arranged for Tara at Tickety Boo Events to style the barn for the ceremony and she did a superb job. Seeing the barn for the first time was a very emotional moment. 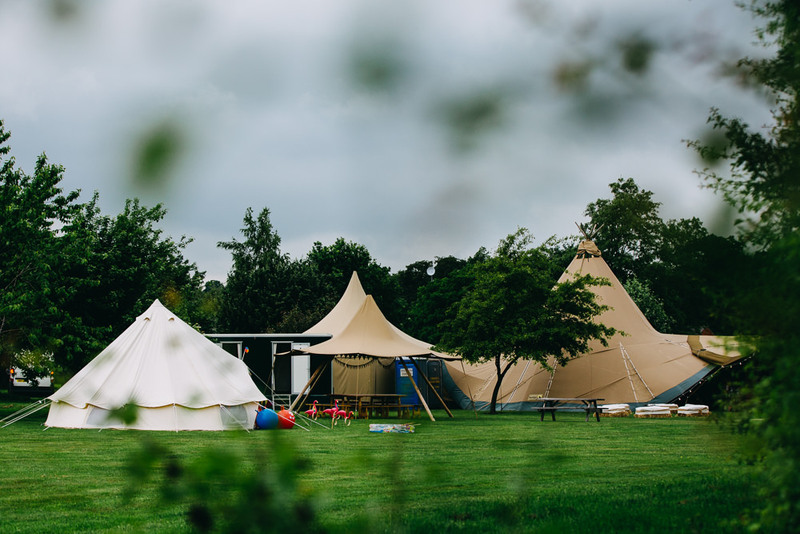 The tipis gave us the perfect blank canvas to bring our vision to life. 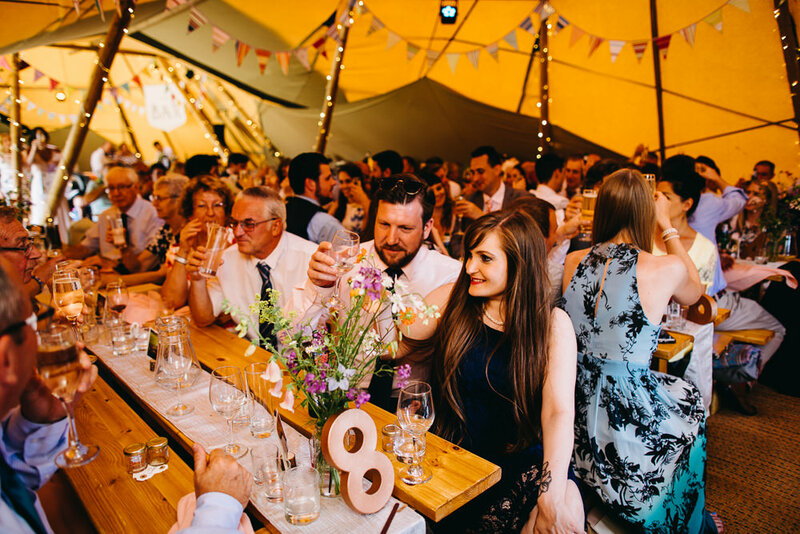 We had three giant hat tipis in an arc formation which allowed us to create three distinct areas – one for eating, one for drinking and one for dancing. 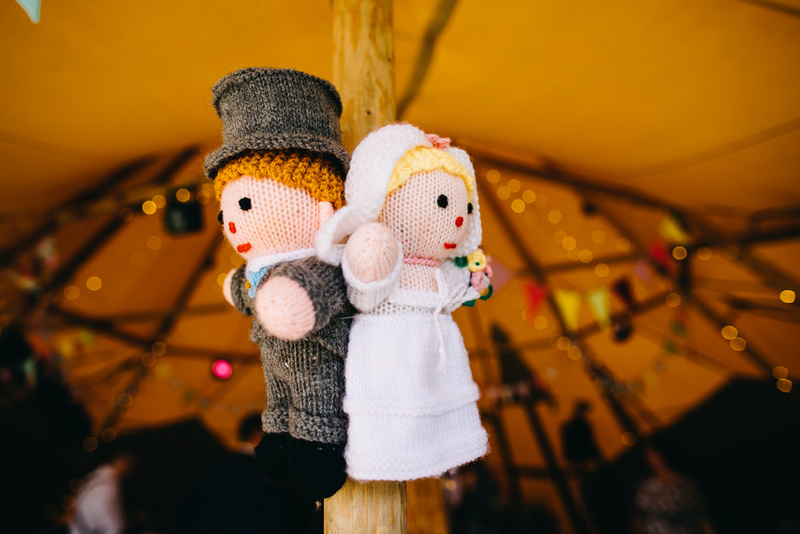 The tipis are so impressive that we kept it quite simple and there was a fair bit of DIY decor and thrifty finds. My mum spent hours making 150 metres of the most beautiful bunting I have ever seen and she also made all of the table runners. All of the handwritten signs were done freehand by myself, my favourite being the order of the day which I wrote on an old 8 pane window. 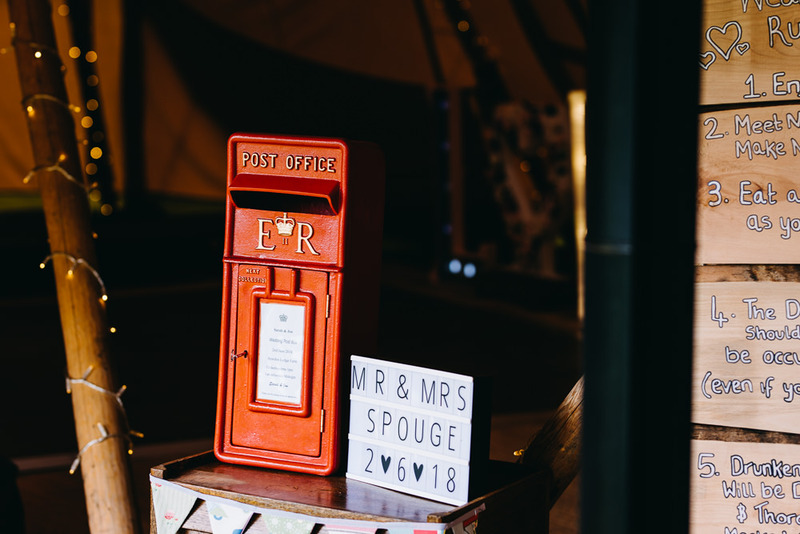 The post box was hired in and displayed on a vintage tea trolley we rescued from a skip and it worked a treat! 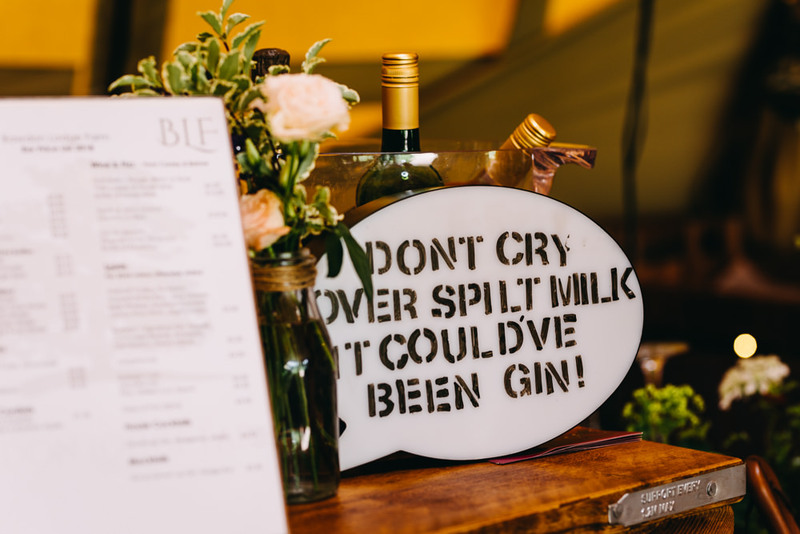 I also made two flavours of fruit infused gin as favours which was a fitting gift as the Burleighs Gin distillery happens to be onsite at Bawdon. Part of our invite was a ‘draw the outfit’ RSVP (designed by my immensely talented friend Emily Cole Illustrations) so we also dedicated an area on the dance floor to display them all. Outside we had hay bales and fire pits to create seating areas. 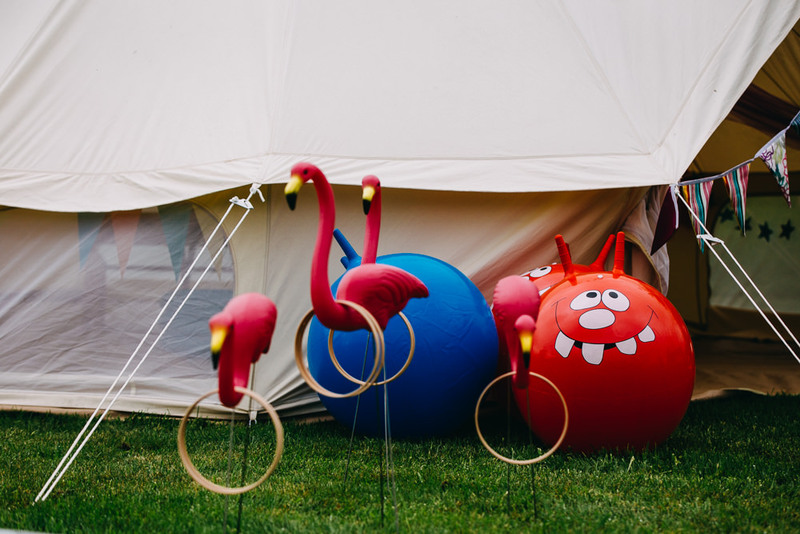 We had space hoppers, giant Jenga, hook a duck and a ring toss made from garden flamingos. 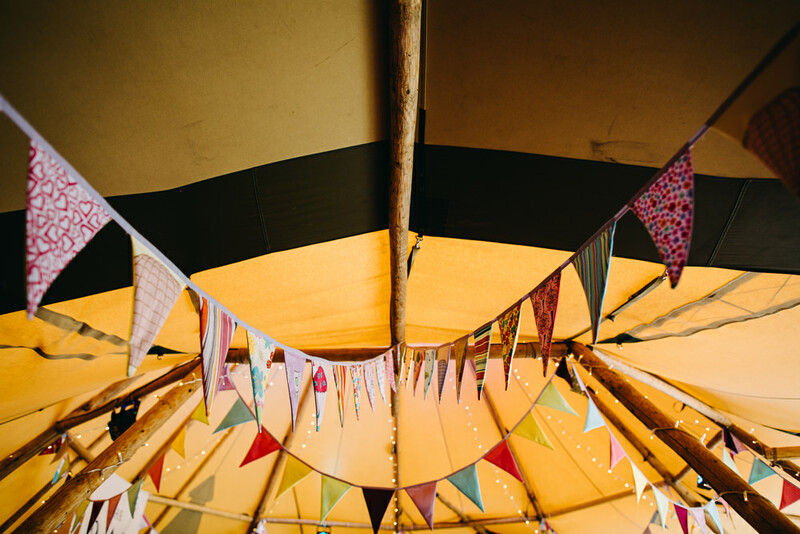 We hired bell tents from Bell Bliss as accommodation for ourselves and guests to stay in. 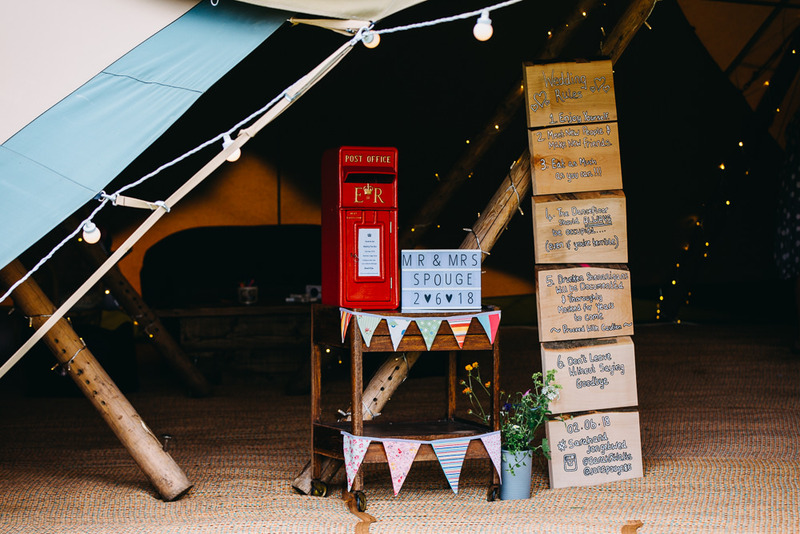 I also used a bell tent to create an area for the kids which went down a storm. 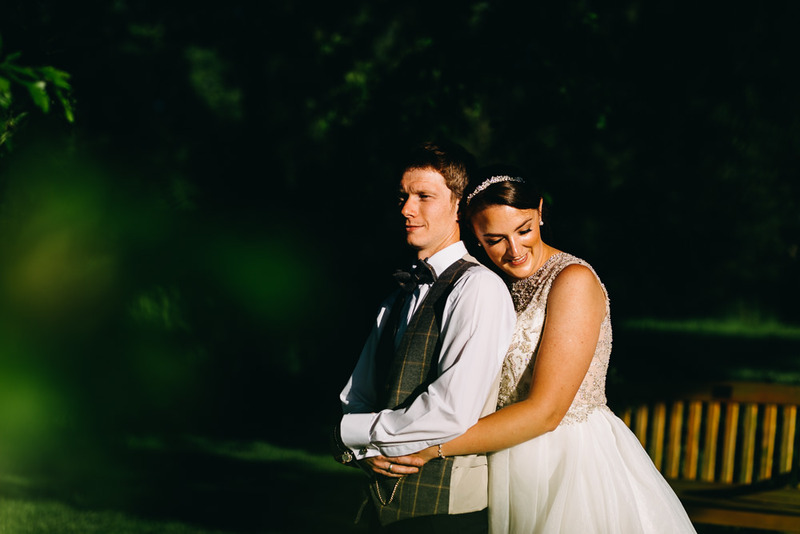 After the wedding we flew to Italy for a mini-moon, spending one night in Pisa and three nights in Florence. 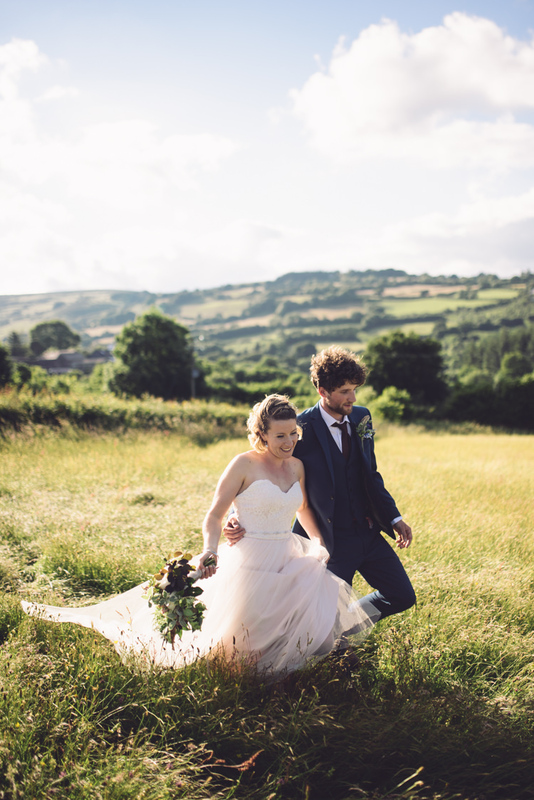 It gave us the perfect opportunity for us to unwind and reflect on our wonderful wedding day before we returned to work. For our main honeymoon we chose New York and it really was the trip of a lifetime! Thomas the Caterer provided us with an awesome personalised menu. We knew we wanted a relaxed style of food to compliment the rest of the day but also a menu that incorporated our personalities and my excessive love of cheese! Thomas and his team were simply the best. 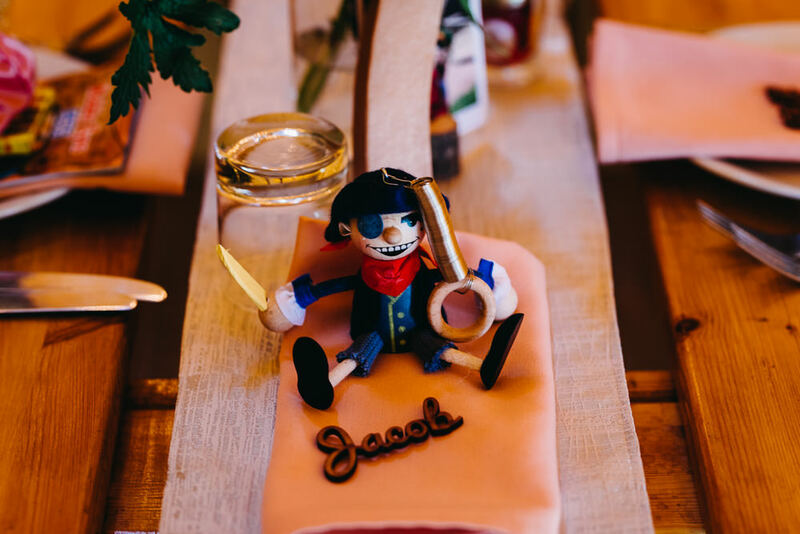 He listened to all of our crazy mixed up ideas and used his creative flare to put together an epic menu. We had afternoon tea themed canapés, an entirely cheese based starter, picnic style main course and the best cheesecake I have ever tasted for dessert. He also provided a fudge kitchen alongside the coffee station and did fish and chips served in NYC style takeaway boxes for the evening food. 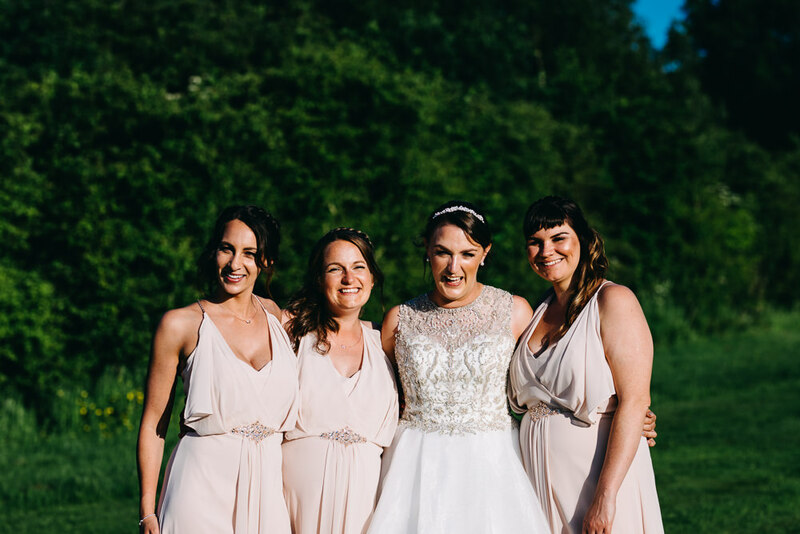 I had three friends as bridesmaids – Josie, Zara and Laura. 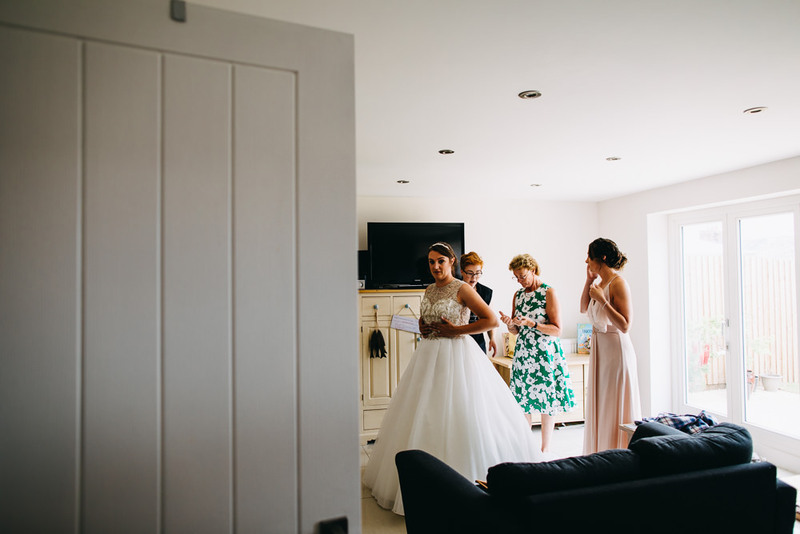 As there was no set colour scheme I decided to keep their dress colour quite neutral. 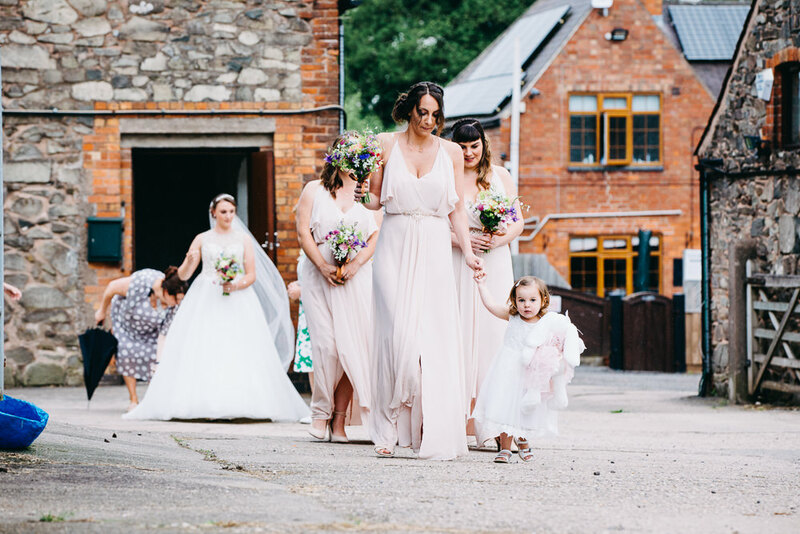 They wore Jenny Packham No.1 Mayfair dresses in pale pink with rose gold beading on the bustle and straps. I managed to get these from Debenhams at 70% off so they were an absolute bargain! 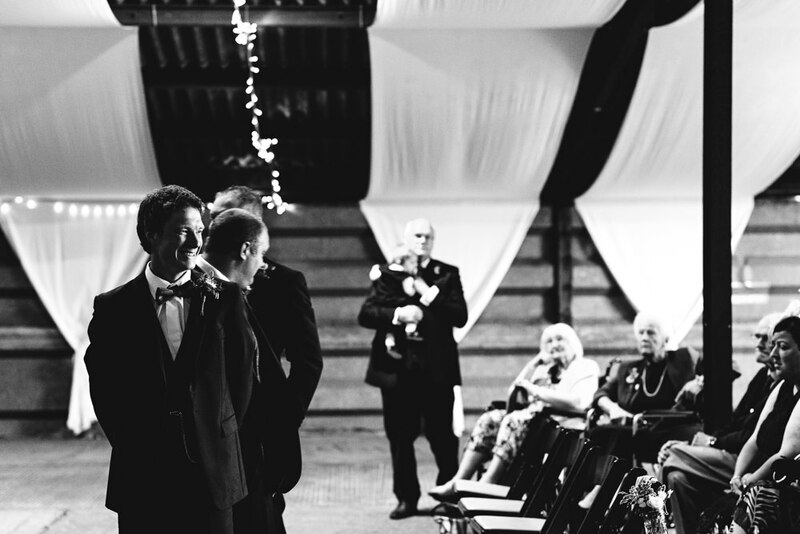 We had both Jon’s brothers, Rob and Ed, as best men and no ushers. They were in the same style suits as Jon all of which were hired from Jon Paul Menswear. 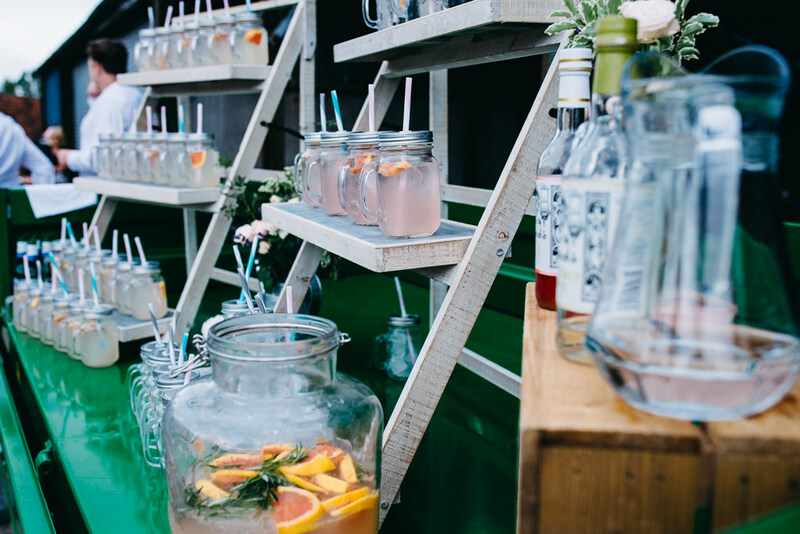 They offered a good variety of mix and match options which meant everyone could have something slightly different from the same range to suit them. 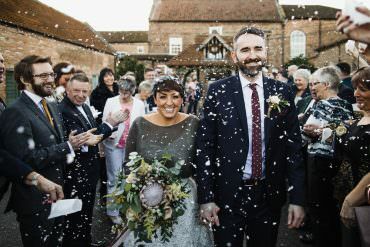 We knew from day one we wanted someone who could capture natural, candid and creative shots rather than the traditional posed photos. 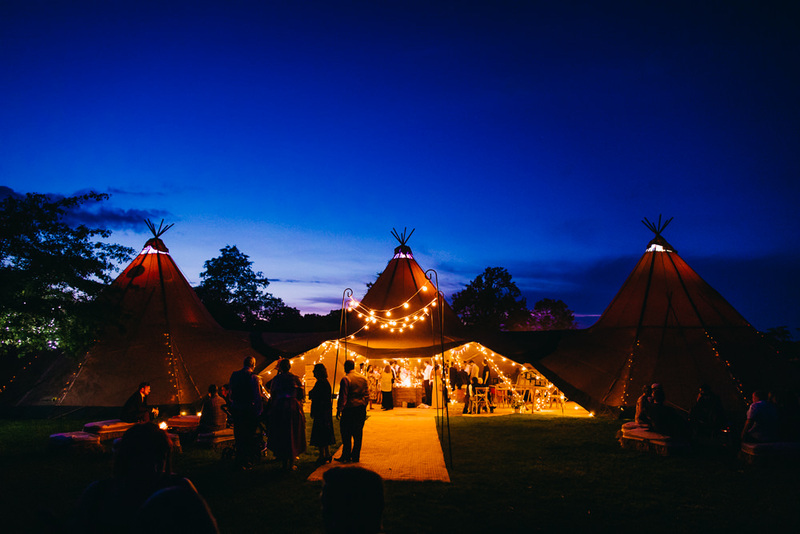 We were lucky enough to meet Hannah Hall Photography at a Sami Tipi evening event and we totally fell in love with her as a person before we’d actually seen a single piece of her work. 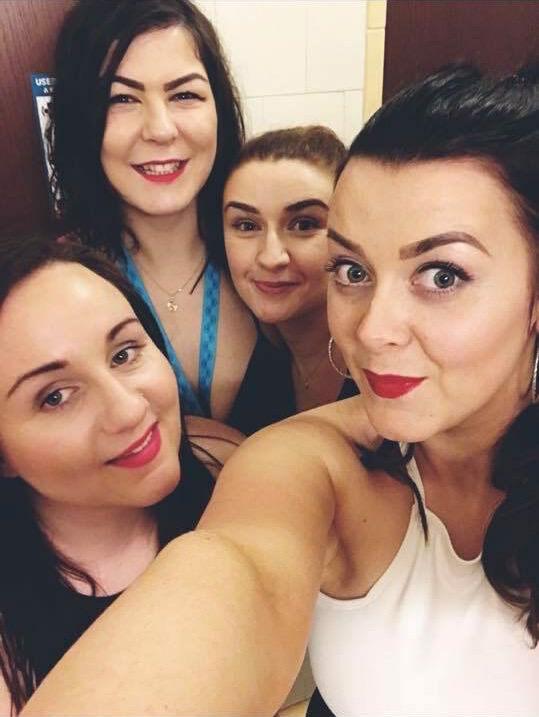 We just seemed to gel, she was like a long lost friend rather than a total stranger and that was really important to us as it immediately put us at ease and made us feel comfortable around her. 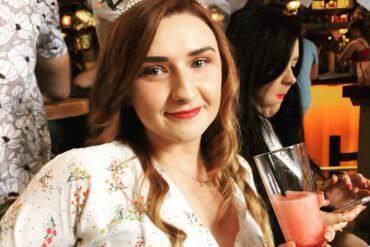 Hannah was professional, discreet and kept it all very fun and relaxed which made her just wonderful to work with. 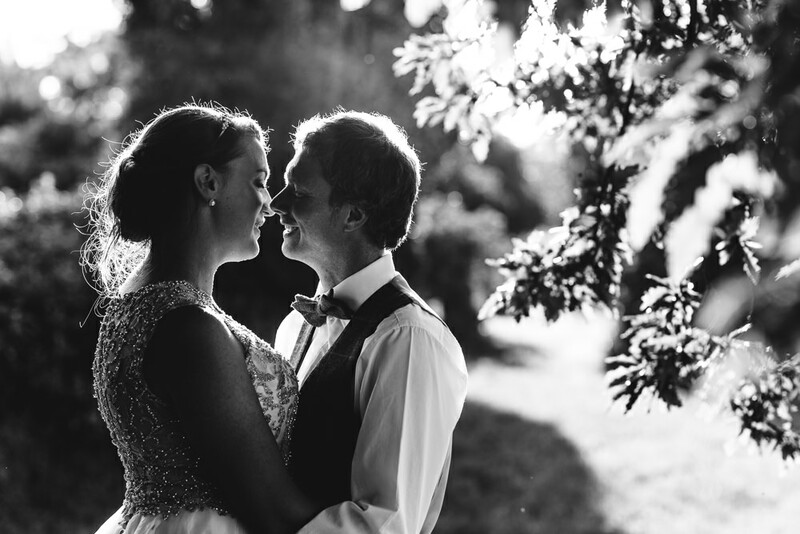 We opted for a second shooter on the day and Hannah brought along the lovely Steve which meant we ended up with eyes everywhere to capture those extra special moments. 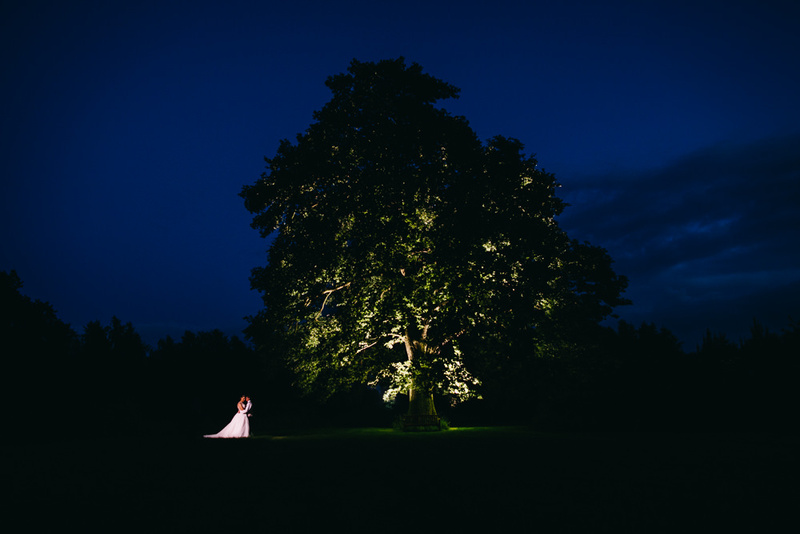 We always knew the pictures would be pretty special, but my goodness look at them! They are simply stunning! Hannah hasn’t just given us back the memories, she has allowed us to feel the emotion in each and every image for the rest our lives and that is something we are eternally grateful for. 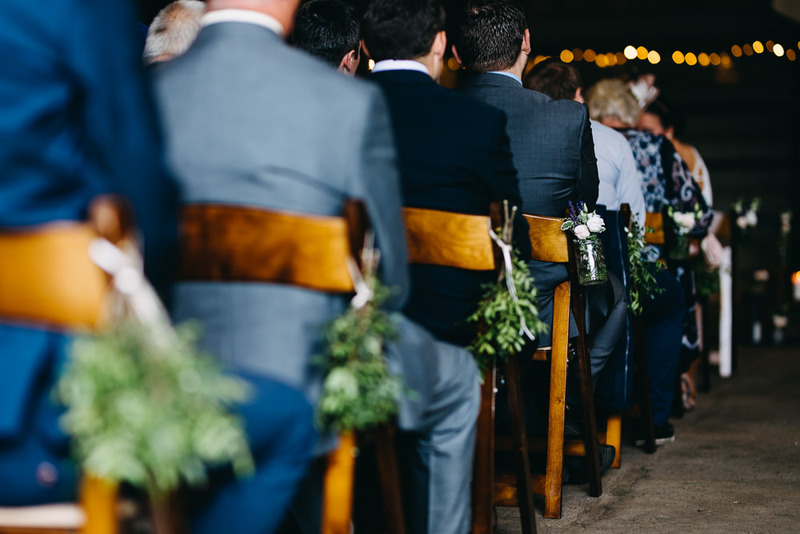 We both agree that saying our vows in front of all of our friends and family was the most precious moment. 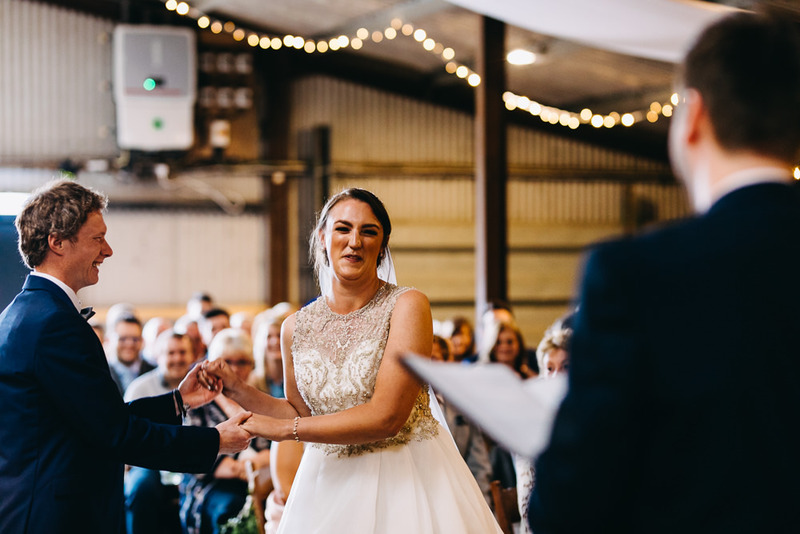 And being the first licensed ceremony to take place at Bawdon Lodge Farm made those first steps as Mr and Mrs extra special. It’s so hard to pick out individual moments. 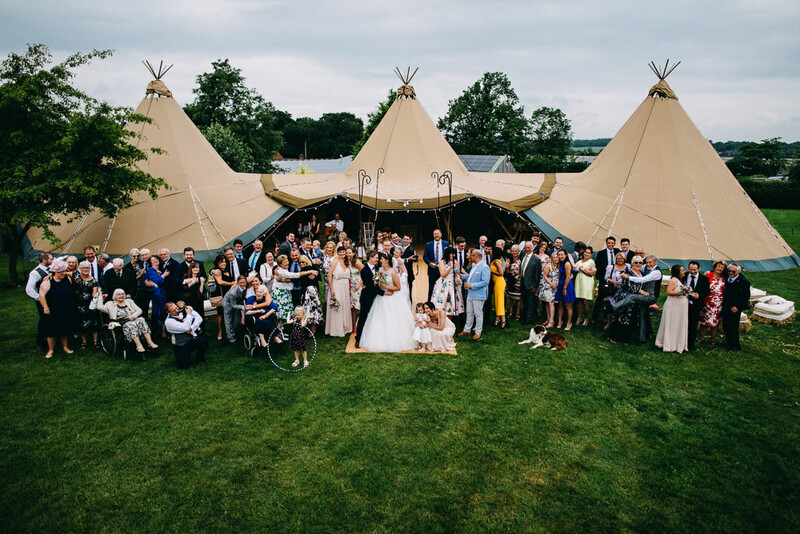 The whole day was genuinely the best day of our lives and having everyone we love with us to celebrate all under one roof (or three tipi hats in our case!) meant the world to us. 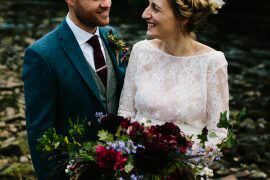 Pinterest has always been my absolute favourite app but during the wedding planning I found it could be a very dangerous place. I quickly became overloaded so streamline your ideas and let them evolve as your planning journey progresses. It is YOUR day and no one else’s so express your personality and don’t be afraid to do things your way. 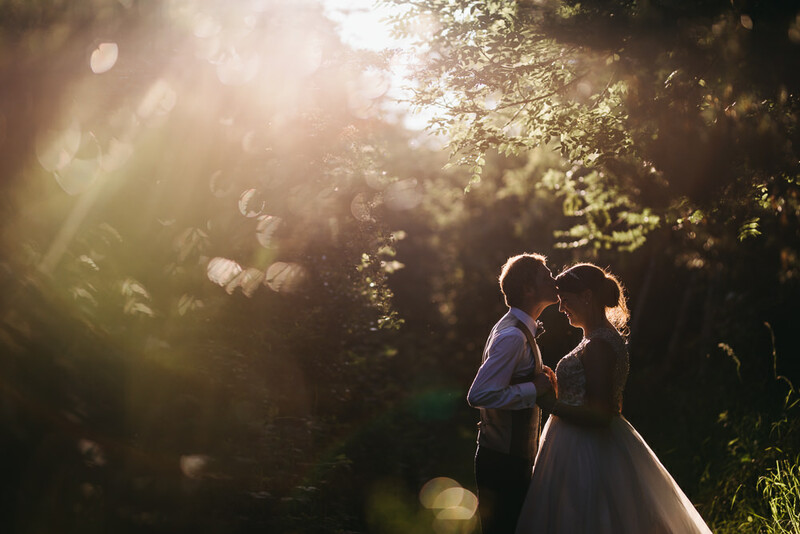 We had all the things we wanted and we’re so glad we did as it made for the perfect day for us. 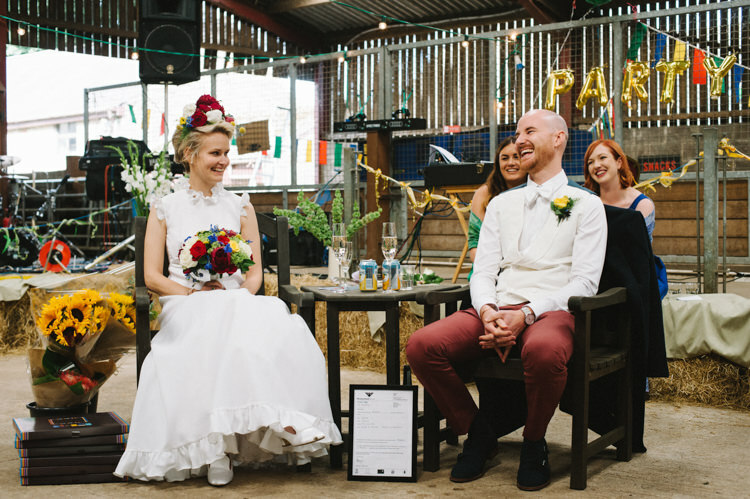 Our planning journey was made so special by all of our wonderful suppliers. We had the most incredible team of people around us who embraced our ideas and gave us a level of support throughout which was simply priceless. Choose who you work with wisely and learn to trust them as there is a reason they are good at what they do! 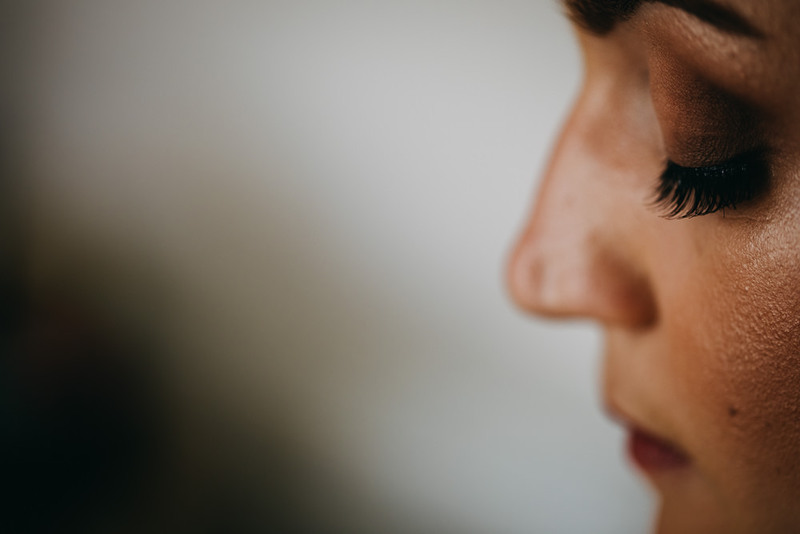 It all goes so fast so enjoy every last second and make sure you take 10 minutes together to stop and absorb it all – it’s pretty overwhelming!